The Greening the Grid Glossary includes terms and definitions that are commonly used in discussion of grid integration issues. The definitions are adapted in part from the Federal Energy Regulatory Commission, the North American Electric Reliability Commission (NERC), and the National Renewable Energy Laboratory’s Transmission Grid Integration Glossary. For a complete glossary of terms related to reliability standards, click here to access the Glossary of Terms Used in NERC Reliability Standards. Active power The portion of electricity that establishes and sustains the electric and magnetic fields of alternating-current equipment. Adequacy The ability of the electric system to supply the aggregate electrical demand and energy requirements of the end-use customers at all times, taking into account scheduled and reasonably expected unscheduled outages of system elements. Advanced inverter A power electronics device that transforms variable direct current to alternating current and that provides functions such as reactive power control and voltage and frequency ride-through responses to improve the stability, reliability, and efficiency of the distribution system. Ancillary services Those services necessary to support the transmission of capacity and energy from resources to loads while maintaining reliable operation of the Transmission Service Provider's transmission system in accordance with good utility practice. Area control error The instantaneous difference between a Balancing Authority’s net actual and scheduled interchange, taking into account the effects of Frequency Bias and correction for meter error. Automatic generation control A regulatory mechanism and set of equipment that provides for automatically adjusting generation within a balancing area from a centralized location to maintain a specified frequency and/or scheduled interchange. Balancing authority The responsible entity that integrates resource plans ahead of time, maintains load-interchange-generation balance within a Balancing Authority Area, and supports Interconnection frequency in real time. Balancing (authority) area The collection of generation, transmission, and loads within the metered boundaries of the Balancing Authority. The Balancing Authority maintains load-resource balance within this area. Base load The minimum amount of electric power delivered or required over a given period at a constant rate. Baseload generating plants Typically coal or nuclear generating units, these plants are usually committed and dispatched at constant or near-constant levels with minimum cycling. They are often the sources of lowest-cost energy when run at very high capacity factors. Battery See Electric Energy Storage. Bid-based centralized market The framework for restructured electricity markets where all generators bid in costs to a centralized market operators. The generators selected for dispatch then receive a uniform clearing price based on the cost of the marginal generator. Black-start A generating unit(s) and its associated set of equipment which has the ability to be started without support from the System or is designed to remain energized without connection to the remainder of the System, with the ability to energize a bus, meeting the Transmission Operator’s restoration plan needs for real and reactive power capability, frequency and voltage control, and that has been included in the Transmission Operator’s restoration plan. Boundary of application The geographic area being considered in the REZ process, which may consist of a local, regional, national, or multinational region—principally determined by the existing layout, operation, and regulation of the transmission infrastructure. Buy all, Sell all A compensation mechanism for distributed generation system owners in which all energy is consumed from and sold to the grid at a standard, often fixed long-term, rate–under these mechanisms no energy produced by the system is consumed on-site. Often referred to as a feed-in-tariff. Candidate zone map Map showing the location of the candidate zones in the REZ process. Candidate zones Subset of study areas in the REZ process that have high-quality resources and high probabilities of being developed, as demonstrated by sufficient commercial interest. Capacity factor A measure of how much energy is produced by a plant compared with its maximum output. Capacity factor is measured as a percentage, generally by dividing the total energy produced during some period of time by the amount of energy the plant would have produced if it ran at full output during that time. Typical capacity factors for wind and solar PV in regions with good resources are about 30-50% and 15-20%, respectively. Capacity credit The contribution of a power plant to reliably meeting demand. Capacity value calculations Determine the ability of wind and solar generators to reliably meet demand, require time-synchronous (at least hourly) wind and solar resource and load data, preferably covering a multi-year time series. These calculations also incorporate data on conventional power plants, demand response, and storage capabilities. Community solar A jointly owned or third-party-owned PV system, typically offsite, which offsets the energy consumption of multiple individual businesses or households participating in the program. Participants purchase a share of the energy produced by the system and receive the benefits on their electric bill. Compensation mechanism Instruments designed to financially reward the distributed generation system owner for electricity that is self-consumed and/or exported to the utility grid. Consolidated operation Consolidated operation is the merging of two or more balancing areas into a single operational entity. Consolidated operation combines all the various stages of system operation including unit commitment, economic dispatch, and reserves provision, all while considering transmission adequacy and tracking the provision of energy from all individual generators. Consolidated operation also facilitates the appropriate compensation for generators providing energy and ancillary services. Contingency The unexpected failure or outage of a system component, such as a generator, transmission line, circuit breaker, switch or other electrical element. Contingency reserves Reserves used to respond to an unexpected failure or outage of a system component, such as a generator, transmission line, circuit breaker, switch or other electrical element. Curtailment A reduction in the output of a generator from what it could otherwise produce given available resources. Decision makers Entities with the authority to launch planning and approve investment decisions (e.g., ministry officials, regulators, and others with power granted to them by the government). Demand response Voluntary (and compensated) load reduction used as a system reliability resource. 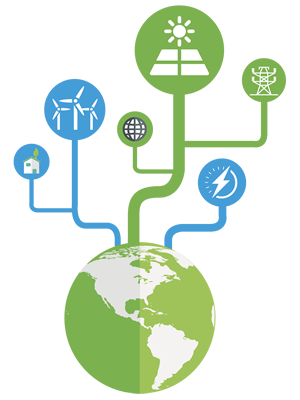 Demand response allows utilities to cycle certain loads on and off in exchange for financial incentives. Demand-side management (DSM) Demand-side management and demand response enable consumers to participate in load control based on price signals. Development adjustment factor (DAF) A metric used in the REZ process representing the estimated percentage of total potential capacity likely to be developed after accounting for the potential reasons that investment might not occur on a specific site (e.g., limited capital) despite technical feasibility—typically technology-specific. Distribution network The interconnected set of equipment, including substations, wiring, poles and metering equipment, which connects retail customers to the transmission system and non-distributed generation. Also known as the distribution system. Distribution system operator An entity responsible for operating, maintaining, and developing the distribution system and its interconnections with other systems. Distribution utility An entity responsible for operating, maintaining, and developing the distribution network and its interconnections with other systems. Dynamic transfer The provision of the real-time monitoring, telemetering, computer software, hardware, communications, engineering, energy accounting (including inadvertent interchange), and administration required to electronically move all or a portion of the real energy services associated with a generator or load out of one Balancing Authority Area into another. Economic dispatch The allocation of demand to individual generating units on line to effect the most economical production of electricity. Effective load-carrying capacity (ELCC) The effective load-carrying capacity (ELCC) of a generator is defined as the amount by which the system’s loads can increase when the generator is added to the system while maintaining the same system reliability. Electric energy storage Technologies capable of storing electricity generated at one time and for use at a later time. Storage technologies include batteries, pumped hydroelectric power, compressed air storage, thermal storage, and others. Also Storage and Battery. Energy imbalance service A market service that provides for the management of unscheduled deviations in individual generator output or load consumption. Excess generation The energy produced by a distributed generation system over and above what the system owner can consume themselves that can be potentially sold back to the grid. Fault An event occurring on an electric system such as a short circuit, a broken wire, or an intermittent connection. Fault ride through (FRT) The capability of electrical devices, especially wind generators, to be able to operate through periods of lower grid voltage. Feed-in-tariff An energy supply policy focused on supporting the development of new renewable energy projects by offering long-term purchase agreements for the sale of renewable energy electricity. Flexibility (Operational) The ability of a power system to respond to changes in electricity demand and supply. Flexible generation The ability of the generation fleet to change its output (ramp) rapidly, start and stop with short notice, and achieve a low minimum turn-down level. Flexible transmission networks Extending transmission lines and interconnecting with neighboring networks provides the power system greater access to a range of balancing resources. The aggregation of generation assets through interconnection improves flexibility and reduces net variability across the power system. Other sources of flexibility include smart network technologies and advanced network management practices that minimize bottlenecks and optimize transmission usage. Forced outage 1. The removal from service availability of a generating unit, transmission line, or other facility for emergency reasons. 2. The condition in which the equipment is unavailable due to unanticipated failure. Forecast error The difference between actual and predicted time-series values of wind and solar resource data. system frequency and decrease output (or increase consumption) in response to an increase in system frequency. Primary frequency response takes place within the first few seconds following a change in frequency. Secondary frequency response (also known as regulating reserve) takes place on a timescale of minutes (or faster) following a disturbance. Generator trip A generator failure caused by electrical or mechanical malfunction that causes a contingency condition on a power system. Generator trips occur very quickly, usually within a few cycles. Contingency reserves provide sufficient online generation to replace tripped generators. Governor response The immediate proportional increase or decrease in real power output provided by generating units/generating facilities, and the natural real power dampening response provided by load, to stabilize system frequency when deviations occur. Grid congestion The event that occurs when actual or scheduled flows of electricity over a line or piece of equipment are constrained below desired levels. Grid integration of renewable energy The practice of power system planning, interconnection, and operation that enables efficient and cost-effective use of renewable energy while maintaining the stability and reliability of electricity delivery. Grid integration study (Sometimes referred to as Power Systems Planning Studies) An analysis of a set of scenarios and sensitivities that seeks to inform the stakeholders on the ability and needs of a power system to accommodate significant variable renewable energy. Hosting capacity The ability of a distribution circuit to accommodate additional distributed generation without the need for circuit upgrades. Independent system operator (ISO) An individual at a control center of a balancing authority, transmission operator, or reliability coordinator, who operates or directs the operation of the bulk electric system in real time. Inertial response Inertial response is the immediate response to a power disturbance based on a supply-demand imbalance. This response is typically provided by synchronous machines that immediately inject (extract) kinetic energy of their rotating masses to (from) the grid, thereby slowing down (speeding up) their rotation and system frequency during loss-of-supply (-load) events. Wind power can emulate inertial response through the use of power electronics controls to provide immediate energy to reduce the rate of frequency. Interconnection An independent electricity system network that operates at a particular frequency. An interconnection consists of one or more balancing area authorities that balance demand and generation within certain geographic areas of the interconnection. Interconnection procedure A process by which a distributed generation system is connected to the larger distribution system and is allowed to sell electricity to the grid, provided the system meets some minimum technical standard to ensure its participation in the grid will not adversely impact system reliability. Interruptible load or interruptible demand Demand that the end-use customer makes available to its Load-Serving Entity via contract or agreement for curtailment. Lead Entity The decision maker that initiates and oversees the planning activity for the REZ process and ensures its completion. Line capacities The maximum and minimum voltage, current, frequency, real and reactive power flows on individual equipment under steady state, short-circuit and transient conditions, as permitted or assigned by the equipment owner. Load An end-use device or customer that receives power from the electric system. Load following reserve Load following compensates for normal (non-event) variability and uncertainty of net load by addressing intra-hour to inter-hour variability. Load following is slower than regulation, and thus do not require automatic generation control. Load forecast A prediction of future demand. For normal operations, daily and weekly forecasts of hour-by-hour demand are used to develop generation schedules that ensure sufficient quantities and types of generation are available when needed. Load serving entity (LSE) An organization that supplies energy and transmission to meet the electricity demand of its end-use customers. A utility is an example of an LSE. An LSE procures electricity from power producers, which operate electricity generating facilities, and which may be independent or owned by the LSE. Load shedding The reduction of system demands by systematically and in a predetermined sequence interrupting the load flow to major customers and/or distribution circuits, normally in response to system or area capacity shortages or voltage control considerations. Loss of load expectation (LOLE) The loss of load expectation is the sum of the LOLPs during a planning period—typically 1 year. LOLE gives the expected number of periods in which a loss-of-load event occurs. Power system planners aim for a certain LOLE target, such as 0.1 days/year or 0.1 events/year. Loss of load probability (LOLP) The loss of load probability is defined as the probability of a loss-of-load event in which the demand is greater than available generating capacity during a given period. Locational marginal price (LMP) The market-clearing price for electricity at the location the energy is delivered or received. Minimum run (turn-down) level The minimum output that can be provided by a generator. Different generators have different minimum run levels based in part on fuel source, plant design, and common use. Marginal unit The next generator to be dispatched at any point in time is the marginal generator or on the margin and typically sets the market price for that market period. Power system operators dispatch generators based on cost (sequentially from lowest to highest cost) and physical capabilities. Meter Technical equipment used by the utility in order to track the consumption of electricity from the grid, and increasingly, the sale of electricity back to the grid. Negative market pricing Occurs when the marginal price is negative (less than zero) meaning all generators pay to produce energy and all loads get paid to consume energy. Occurs when the amount of generation exceeds demand due to a variety of operational constraints. Net billing A compensation mechanism for distributed generation system owners that allows for real-time, on-site consumption of DG generation with generation in excess of consumption sold back to the grid at a pre-determined rate. Net energy metering A compensation mechanism for distributed generation system owners that allows the system owners to sell the energy they are producing in excess of what they are consuming back to the grid in exchange for credits, which can be applied to offset energy consumed from the grid during a billing cycle. Net load (net demand) Demand that must be met by other generation sources if all wind and solar power is consumed. Non-spinning reserve 1. That generating reserve not connected to the system but capable of serving demand within a specified time. 2. Interruptible load that can be removed from the system in a specified time. Operating reserves Electricity generating capacity that is available to a system operator to provide for regulation (i.e., response to random movements during normal conditions), load forecasting error, forced and scheduled equipment outages, and local area protection. Other types of reserves include contingency (deployed in response to generator failures), regulating (secondary frequency response via AGC), or flexibility (reserves to address variability and uncertainty on timescales longer than regulating reserves). Operational flexibility See Flexibility (Operational). Peak load 1. The highest hourly demand within a Balancing Area occurring within a given period (e.g., day, month, season, or year). 2. The highest instantaneous demand within the Balancing Area. Peaking plants Electricity generating plants that are operated to meet the peak or maximum load on the system. The cost of energy from such plants is usually higher than from baseload plants. Power Purchase Agreements (PPAs) Contracts in which an electricity buyer (a utility or other private entity) purchases power from a project developer who builds, operates and maintains the system. The contract offers power at a negotiated rate for a specific contract term and includes legal obligations and operational requirements. PPAs enable an electricity purchaser to accrue many of the benefits of renewable energy without owning a system. Power systems planning Planning activities include assessing long-range demand and evaluating options for expanding capacity and transmission in a way that minimizes costs while maintaining reliability. Priority development areas Economic development areas identified by the government that offer benefits like expedited permitting or special incentives that may intersect with high-quality renewable energy resources identified during the REZ process. Production cost simulations Production cost simulations optimize the scheduling of load and generation resources to meet expected demand over various timeframes with consideration of cost and constraints (system, physical, operational). This is the leading tool to evaluate the impacts of variable renewable power on the operational costs of a system. Ramp The increase or decrease in output of electricity supply, to follow changes in net demand. Ramp rate The change in output of a generating unit per unit time, often measured in megawatts per minute. Ramping reserve Emerging type of reserve that could be used during failures and events that are not instantaneous but occur over long time frames (e.g., wind ramps, forecast errors). This type of reserve is not uniformly defined. Rated capacity The maximum capacity of a generating unit. Reactive power The portion of electricity that establishes and sustains the electric and magnetic fields of alternating-current equipment. Reactive power must be supplied to most types of magnetic equipment, such as motors and transformers. It also must supply the reactive losses on transmission facilities. Reactive power is provided by generators, synchronous condensers, or electrostatic equipment such as capacitors and directly influences electric system voltage. It is usually expressed in kilovars (kvar) or megavars (Mvar). Regional transmission organization (RTO) An independent entity responsible for maintaining system balance, reliability, and electricity market operation on the bulk system. The RTO allocates transmission rights based on a system of bids and offers, and optimizes unit commitment and dispatch decisions to minimize system costs. Other similar names for this function are Independent System Operator (United States) and Transmission System Operator (Europe). Regulating reserves (also called secondary frequency reserves) Respond to random movements and maintain area control error during normal (non-event) conditions in a time frame that is faster than economic dispatch. Requires automatic control by the system operator. Renewable Energy Zone (REZ) Region with high-quality renewable energy resources designated as a focus for coordinated expansion of generation and transmission. Used to support expansion of wind and solar power in areas that offer higher capacity values by providing, in advance, adequate grid infrastructure to meet projected generation. Reserve sharing Two or more Balancing Authorities that collectively maintain, allocate, and supply operating reserves required for each Balancing Authority’s use in recovering from contingencies within the group. Resource maps Show the theoretical resource potential for technologies considered within each region of interest and form the base layer that is gradually filtered down to identify study areas during the REZ process. Reverse power flow An instance in which power flows from the distributed generation unit back to the grid, or in other words, against its normal direction the grid to the customer, often during times of high generation and low load. Reverse power flow can have adverse impacts on voltage regulation and protection systems. REZ process design document Describes the REZ process in more detail, including steps, deliverables, timeline, responsibilities, and goals in addition to adding transparency and creating a process baseline that bounds subsequent changes as decision makers and stakeholders discuss and adjust the scope. REZ transmission planning Process that enables planning and construction of transmission infrastructure that cost-effectively transports renewable electricity from a REZ to load. REZ transmission optimization study Series of studies (steady-state analysis, dynamic stability analysis, and production cost analysis) for a set of feasible transmission development options (three to five), including both new lines and/ or other transmission improvements such as equipment upgrades, new stations, or transformers. Scheduling The practice of ensuring a generator is committed and available when needed. It also can refer to the scheduling of imports into and exports out of a balancing area. Spinning reserve Generation and responsive load that is online, can begin responding immediately. Stakeholders Group that does not make legally binding decisions but has interests and/or rights in the electricity system and will be affected by decisions. They often have technical information and expertise that can enhance a decision. Storage See Electric energy storage. Study areas Regions within a REZ study's boundary of application capable of supporting large levels of high-quality clean energy development. Subhourly energy markets Electricity markets that operate unit commitment and economic dispatch on time steps of five or fifteen minutes. Supervisory Control and Data Acquisition (SCADA) A system of remote control and telemetry used to monitor and control the transmission system. Supplemental reserve Generation and responsive load that is offline but can be fully responsive and online within a short period of time to replace spinning reserve that has been activated in response to a contingency or other power system need. System A combination of generation, transmission, and distribution components. System operator An individual at a Control Center of a Balancing Authority, Transmission Operator, or Reliability Coordinator, who operates or directs the operation of the Bulk Electric System in Real-time. System stability studies Analysis and simulation of the grid under a range of dynamic events to evaluate: frequency stability after a major imbalance of generation and load; voltage stability after a disturbance; transient stability to maintain generator synchronism after a disturbance; and small-signal stability to maintain steady-state conditions of voltage, current, and power magnitudes after a small disturbance. Technical advisory committee (TAC) Group that oversees and guides the work of the REZ process. It may include representatives of the Lead Entity, the technical WGs, government agencies, stakeholders, and possibly other organizations that can support the process such as transmission system operators. Third-party ownership A business model in which a third-party developer procures, finances, and owns a distributed PV system instead of a building owner. The building owner hosts the PV system and purchases the electricity generated from the system using a power purchase agreement or lease. Transmission and generation modeling working group (Transmission WG) Group responsible for modeling options for connecting candidate zones to the rest of the grid in the REZ process. It develops transmission enhancement options and models how each option might change, among other things, the total cost of generating electricity—may consist of transmission system operators, energy research institutes, government agencies, and other stakeholders. Transmission constraint A limitation on one or more transmission elements that may be reached during normal or contingency system operations. Transmission development option Feasible transmission expansion plan developed during the REZ process to connect candidate zones to load—includes transmission system limitations, potential transmission improvements, total production costs over a test year, projected constraints, congestion costs, and local marginal cost of electricity. Transmission network A system of structures, wires, insulators and associated hardware that carry electric energy from one point to another in an electric power system. Lines are operated at relatively high voltages varying from 69 kV up to 765 kV, and are capable of transmitting large quantities of electricity over long distances. Transmission operator The entity responsible for the reliability of its “local” transmission system, and that operates or directs the operations of the transmission facilities. Transmission planner The entity that develops a long-term (generally one year and beyond) plan for the reliability (adequacy) of the interconnected bulk electric transmission systems within its portion of the Planning Authority Area. Turn-down capability The minimum stable generation level that can be achieved by a generating unit. Uncertainty The inability to perfectly predict the electricity demand and/or generator output, which can be caused either by unexpected outages or due to the unpredictability of the resource. Unintentional islanding A situation in which distributed generation continues to supply power after the utility power source has disconnected. Unit A single generator that may be part of a multiple-generator power plant. Unit commitment The process of starting up a generator so that the plant is synchronized to the grid. Value of solar A mechanism to compensate the real value provided to the electric system by solar installations, which can include reduced emissions, deferred transmission or distribution upgrades and ancillary services. Variability The changes in power demand and/or the output of a generator due to underlying fluctuations in resource or load. Variable renewable energy (VRE) Electricity generation technologies whose primary energy source varies over time and cannot easily be stored. Variable generation sources include solar, wind, ocean, and some hydro generation technologies. Variable renewable energy generation forecasts Forecasts of time- and location-specific wind and solar resource data. Used as the basis for estimating power generation potential and characterizing variability and uncertainty. Vision statement Establishes the goal of the REZ process—a process to enhance transmission infrastructure that cost-effectively and fully uses the best renewable resources in the region—in addition to clarifying the scope of the REZ process. Voltage The difference in electrical potential between any two conductors or between a conductor and ground. Voltage is a measure of the electric energy per electron that electrons can acquire and/or give up as they move between the two conductors. Voltage regulator A device designed to maintain voltage levels within acceptable limits. Voltage ride through The ability of distributed generator to remain connected to the grid during and after a period of lower system voltage in order to prevent a widespread loss of generation. Zone identification and technical analysis working group (Zone WG) Group in the REZ process that conducts the step-by-step screening that results in a list of candidate zones—may include renewable energy technology experts, meteorological experts, power system planners, land use planners, wildlife experts, and other stakeholders.